Located in Silver Pointe shopping mall ! 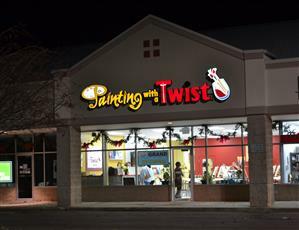 To schedule a Private Party just email the studio at studio216@paintingwithatwist.com with your date request, or call us at 810-629-7928 and we'll get your party plan started! Any other reason to "party"
You get to select your own painting from our collection of over 5,000 pieces! You can schedule your private party any day of the week where a studio and an artist are available! You get a private party room and your own artist-instructor! You pay the same price as our regular public class! You don't set up and don't clean up... you just show up! You get the room 30 minutes before class to decorate and celebrate! You can view our online calendar to check our private party availability and call us at 810.629.7928 to see if your party time is available. A two seat deposit is required. There is a two-week cancellation policy. If you want to cancel your party less than 2 weeks away, a $150 cancellation fee applies. Private parties do not cost extra! The 2-hour paintings are $35.00 per person and the 3-hour paintings are $45.00 per person. We have some art that is $25 per person for 1.5 hours and for ages 8-12 only. When you book a party and pay your deposit, we will send you a link to the art library to choose 1 painting for the event! Guests have two options for payment; Your guests register and pay in advance online with your passcode given after you return the contract, or you may pay in advance and have them pay you back. Pre-payment is required. Please remember that All guests attending need to be pre-registered, paid and painting. Unfortunately, we cannot accommodate observers or infants in any event. The Minimum number of painters required for a private party is 10. For example, if 8 people attend the party, the card will be charged for 2 additional people to meet the minimum requirement. We can accommodate up to 22 guests in our smaller studio, and up to 45 guests in our larger studio. Ages 12 and older may attend before 6pm. Guests 18 years old and older are welcome to any event. No infants or observers. Reminder: If the party minimum is not met, the host/hostess is responsible for the unfilled seats. Private Party Cancellation Policy: Must give at least a 2 weeks’ notice to receive deposit and to avoid an additional $150.00 fee. The class will begin promptly at the scheduled time and the event is finished when the class photo is taken. Please arrive on time! Late arrivals disrupt the class, the painting and the instructor. Guests arriving more than 15 minutes late may not be allowed to paint and will forfeit their payment. We are a licensed establishment with a variety of wine and beer for sale. No Alcohol may be brought into the studio except full size, sealed, cork-able bottles of wine. We cannot allow boxed wine, Minis, or Homemade wine, beer or cider. This includes food with alcohol in it, such as soaked fruit or Jello shots of any kind! See our FAQs for our current beverage selection! If you have any additional questions about our private parties, you can email us directly at studio216@paintingwithatwist.com or call 810.629.7928. 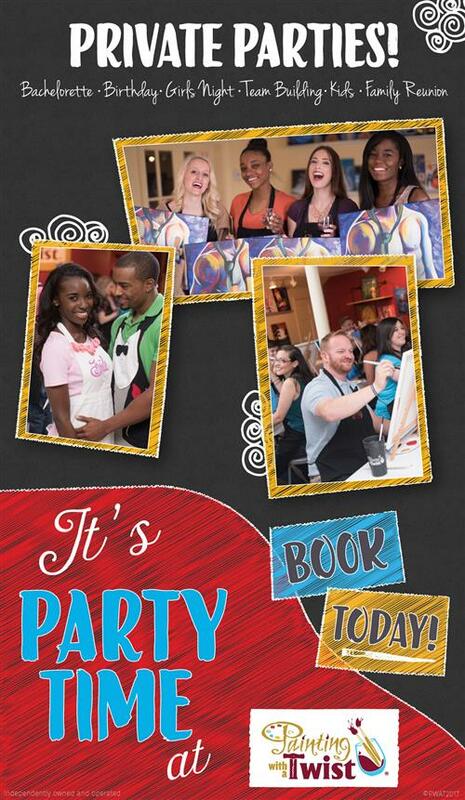 We look forward to hosting your next private party! It's a little bit of paint, a little bit of wine, and a whole lot of fun! We have a Michigan Liquor License which allows us to sell beer and wine, the law states that no alcohol may be brought onto the premises with the exception of full sized, sealed cork-able bottles of wine by a licensed producer. Screw tops are allowed. 18+ may attend any class! After 6pm 18+only. 12-17 may attend before 6pm with an adult. 7+ may attend Family Friendly events. No infants. Feel free to call if you have questions about this! Please see each Event Description for details.